This handsome catamaran offers first-rate design and execution, and easy seaway motion makes it appealing to both experienced and those only just embarking on their first sail. The Casper is a 2013 Lagoon 39 and was listed as one of Sailmagazine.com's best boats. 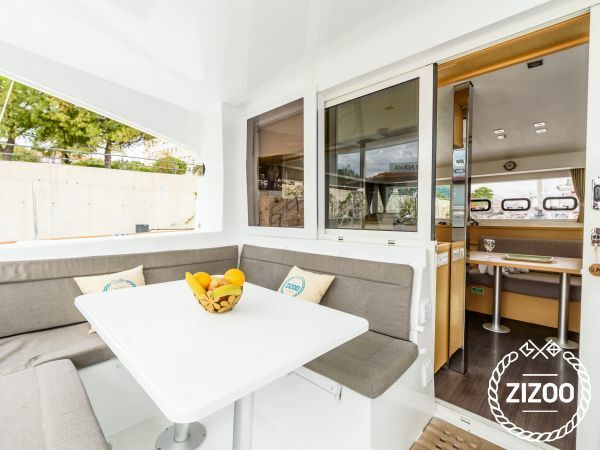 It's comfortably designed 4 cabins offers sleeping space for 8 while there are 2 more available berths in the salon. Sail quietly south from Split to the beautiful Island of Vis and the charming little town of Komiza. There you will be greeted by friendly locals, incredible views and reasonable prices. Explore the island that was once a restricted military base, only becoming open to the public in 1998. Or take the kids to its wonderful pebble beaches where they can wade in the shallows or take their goggles and discover the wonderful world of fish beneath. You can also select from a range of other breathless destinations such as Hvar or Trogir, all within a sail's reach. The Casper is chartered to a young team of ambitious folk who are there to help you with all your sailing needs. My friends and I arranged a summer trip to sail around Split as we'd had recommendations from friends who had been there previously and there were so many things to see. Our skipper, Marko, was so helpful with restaurant and bar reservations and took us to all sorts of little coves and bays as well as the party beaches. The food and nature and whole experience were unbeatable. Exzellenter Katamaran zu einem fairen Preis: Danke für einen tollen Urlaub in Dalmatien!